Today’s most pressing challenges are complex. They span across boundaries and demand collaboration. 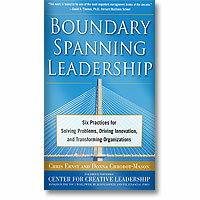 In their forthcoming book, Boundary Spanning Leadership: Six Practices for Solving Problems, Driving Innovation, and Transforming Organizations, Chris Ernst and Donna Chrobot-Mason reveal a powerful approach to leadership in a world where group boundaries collide, intersect and link. Through their research, the authors have identified boundaries that create challenges and leadership practices to help us work effectively across those boundaries. Vertical: Leading across levels, rank, seniority, authority, power. Horizontal: Leading across functions, units, peers, expertise. Stakeholder: Leading at the interchange of an organization and its external partners, such as alliances, networks, value chains, customers, shareholders, advocacy groups, governments, communities. Demographic: Leading between diverse groups, including the full range of human diversity from gender and race to education and ideology. Geographic: Leading across distance, locations, cultures, regions, markets. Wherever boundaries collide, the promise of new possibilities and inspiring results awaits, according to Ernst and Chrobot-Mason. But so does the peril of limiting and counterproductive outcomes that occur when groups divide into Us and Them. The difference, in large part, is you and the leaders throughout your organization. Buffering — monitoring and protecting the flow of information and resources across groups to define boundaries and build intergroup safety. Reflecting — representing distinct perspectives and encouraging knowledge exchange across groups to understand boundaries and foster intergroup respect. Connecting — linking people and bridging divided groups to suspend boundaries and build intergroup trust. Mobilizing — crafting common purpose and shared identity across groups to reframe boundaries and develop intergroup community. Weaving — drawing out and integrating group differences within a larger whole to interlace boundaries and advance intergroup interdependence. Transforming — bringing multiple groups together in emergent, new directions to cross-cut boundaries and enable intergroup reinvention. While the six practices may seem daunting, Ernst and Chrobot-Mason have seen Boundary Spanning Leadership in action. In their book (to be released next month) they share the research, the stories and specific actions that lead to new possibilities and inspiring results. Next month: Stories, examples and insights about Boundary Spanning Leadership. Learn more about the six practices and the benefits they bring.